Building correctly is complicated. It requires hundreds of decisions and constant oversight. It requires the abilities to plan and organize. It requires the talents of competent crafts people. Capital Construction offers clients the experience, skills and in-place systems to make the experience pleasant and worry-free. Capital Construction rests midway between the large, corporate-style home builders that churn out scores and even hundreds of similar homes annually and the small-scale builders who construct homes one at a time. Capital Construction is the right size to bring to customers the best of both. Like bigger companies, Capital Construction has the in-house staff to handle critical elements in the building process. State-of-the-art management systems. Billing, correspondence and other documentation organized in accord with Construction Specifications Institute Guidelines. Master Builder software to effectively develop and monitor ”take-offs,” estimating, and scheduling. Sophisticated communications technology and project supervision to keep the Capital Construction team alert, informed and responsive. And well-conceived safety and recycling programs that extend from office to shop to job site. Like smaller companies, Capital Construction stays close to its customers and associates. Volume is deliberately limited. Everyone involved can effectively communicate, attend to details, and anticipate problems before they arise. Doing so keeps a project on schedule and minimizes cost over-runs. Building a new home should be an endeavor in which clients anticipate, enjoy, and, ultimately, take pride. 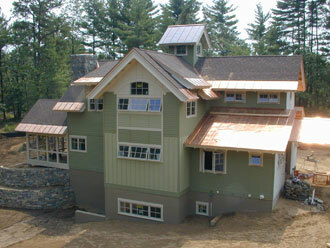 Building a new green home enhances the experience. Green adds both value and a “feel-good” quality. Capital Construction, Inc. is one of the first builders to fully comprehend and embrace what it means to build the right way: green.